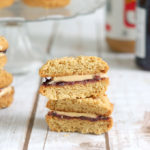 These Ginger Sandwich Cookies are made with both ground ginger and candied ginger for extra gingery flavor. 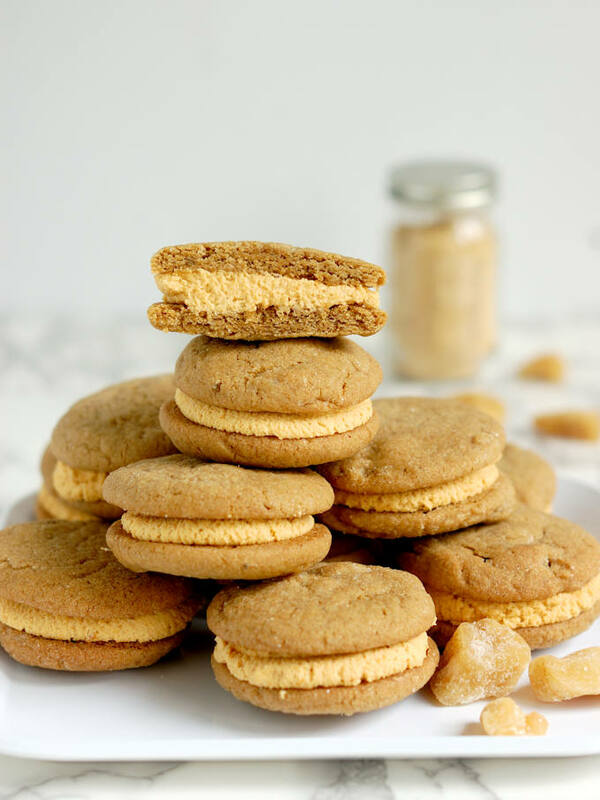 The sweet, spicy cookies are filled with whipped pumpkin ganache. 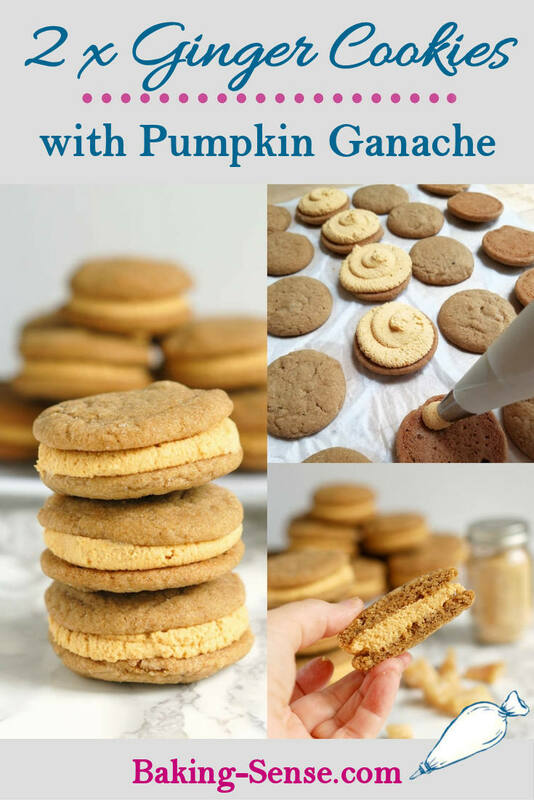 You read that right, PUMPKIN ganache. Ok, I have to admit that sometimes it’s hard to know what to write about a recipe. 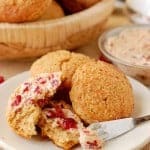 Often it’s pretty clear that I need to explain some details about how a recipe works, or how I came to create a particular recipe, or I need to explain a tricky technique. Occasionally there’s some sort of personal story behind a recipe. Well, for this recipe I don’t have a story. It’s a fairly straight-forward cookie recipe so not much to discuss there. 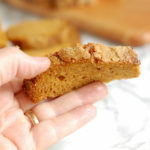 I guess the most interesting thing about this recipe, to me anyway, is the pumpkin ganache filling. 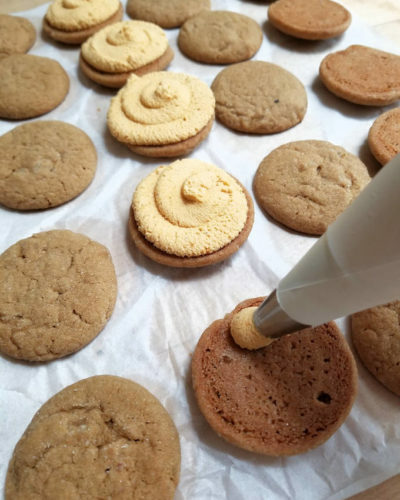 Originally, I planned to make a ginger cookie with a white chocolate ganache filling. It’s a recipe I’ve had in my draft folder for ages. 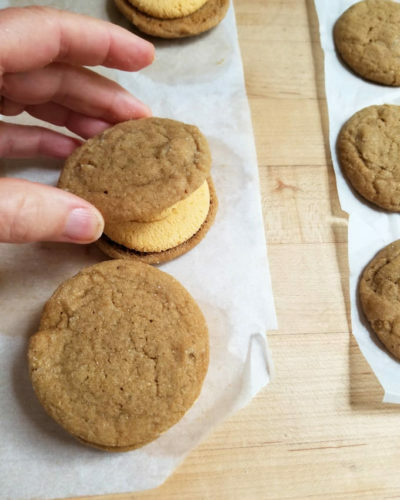 Ever since I made Triple Ginger Ice Cream Sandwiches I knew I wanted to do another ginger sandwich cookie. 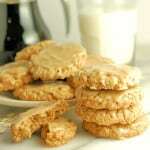 I imagined that sweet, rich white chocolate ganache would be a good counterpart for a nicely spicy ginger cookie. 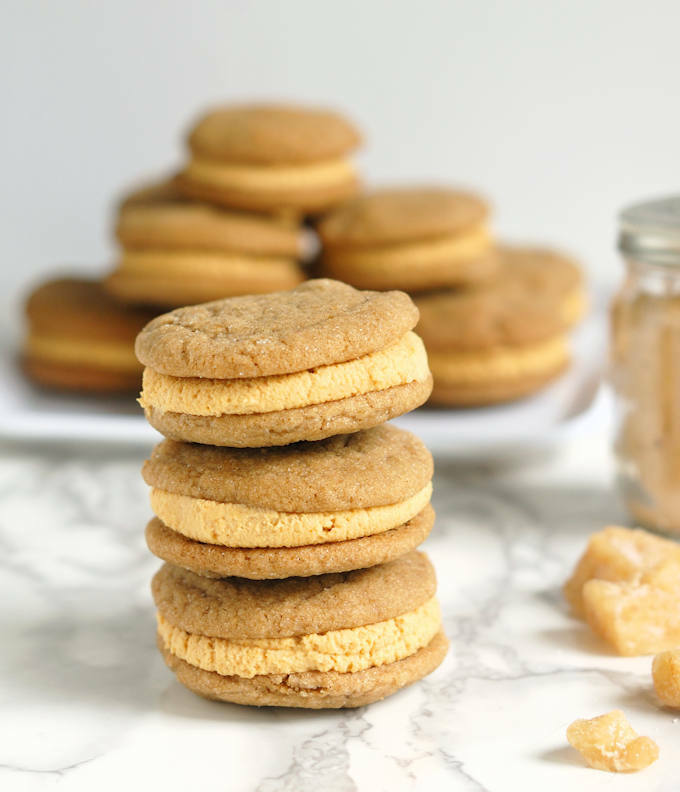 Of course fall is the perfect time of year to make ginger cookies. 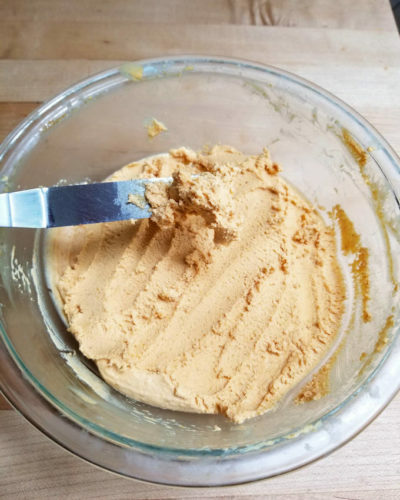 As I was making the white chocolate ganache for the filling the idea just popped into my head to try mixing some pumpkin puree into the ganache. I wasn’t sure if it would set up enough with the puree mixed in. But, happily, it did. And it is delicious. And it is light and airy. And the flavors work perfectly together. I guess I don’t really need to say anything else than, these cookies are GOOOOOD! 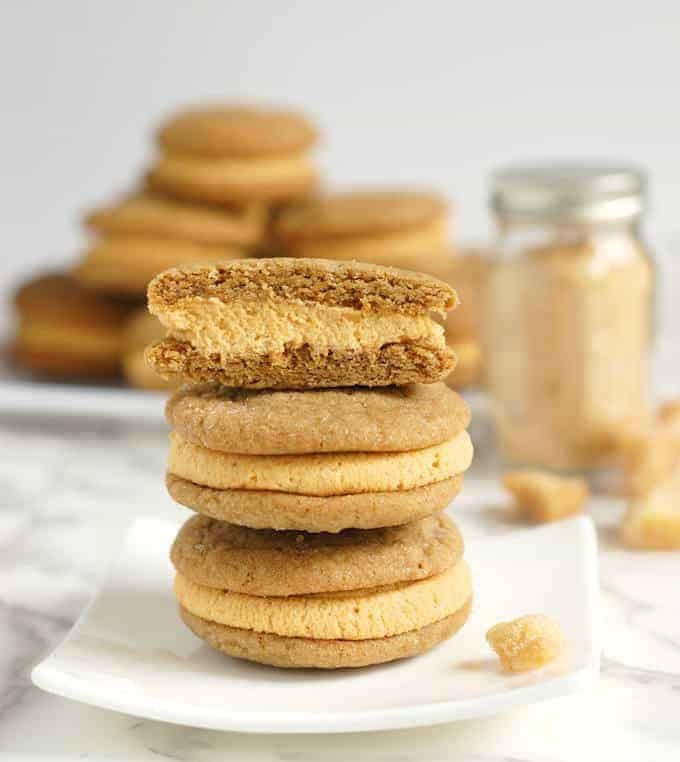 Of course, if you prefer, you can simply eat the super-gingery cookies with no filling at all. 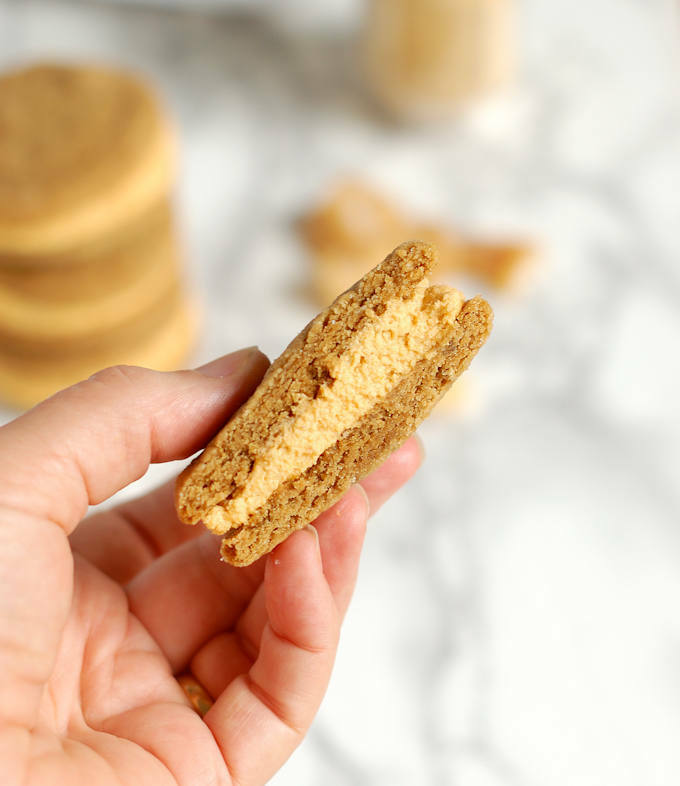 Crackly, crunchy, chewy double ginger cookies are sandwiched with whipped Pumpkin ganache. Preheat the oven to 325°F for convection and 350°F for conventional. On medium high speed, cream together the butter, granulated sugar and brown sugar until light and fluffy. Add the vanilla and molasses and mix to combine. Add the egg and mix to combine. With the mixer on low speed, slowly add the dry ingredients and mix just until combined. 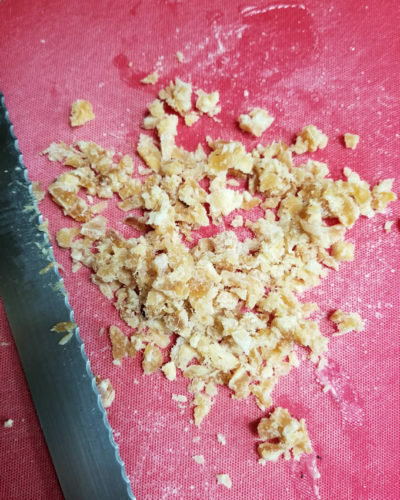 Add the chopped candied ginger. 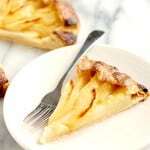 Place the remaining cup of granulated sugar into a wide shallow bowl or pie plate. Use a scooper or a tablespoon to portion the cookies into 1 1/2" balls. 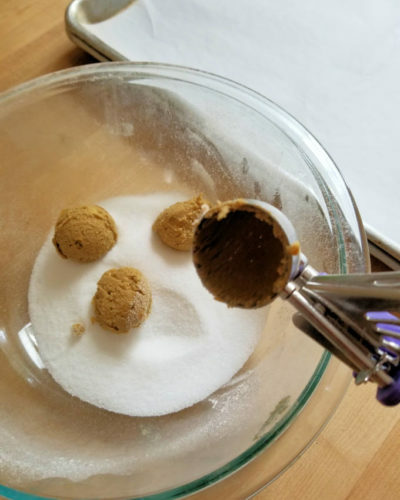 Drop each cookie ball into the granulated sugar and roll to coat. 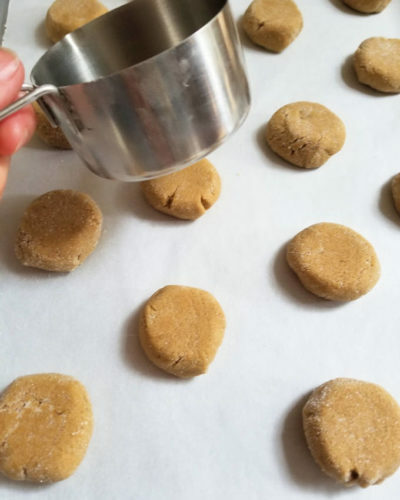 Place the cookies on a parchment lined baking sheet. Gently press each cookie ball to flatten slightly. Bake until the cookies are set but still look slightly under baked in the middle, about 12-15 minutes. The cookies will crack a bit while they bake. Cool on the sheet pan for 5 minutes and then transfer the cookies to a cooling rack to finish cooling. Make the ganache according to the recipe, adding the spices to the cream when you heat it up. Once you have the ganache completely smooth, with no bits of unmelted chocolate, whisk in the pumpkin puree. Cool the ganache to room temperature, then whip the ganache until it becomes light and airy and has the texture of whipped cream. Flip 1/2 the cookies so they are flat side up. Pipe or spread about a tablespoon of ganache onto each flipped cookie. Top with the other cookies. Stored at room temperature in a cookie jar or covered container they will keep for 3-4 days. 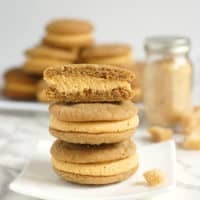 The recipe makes 36 individual cookies or 18 sandwich cookies. How long will the cookies store at room temperature, our should they be refrigerated? Hi Ann. We kept the cookies at room temp for about 3-4 days and they were fine. Ganache is safe at room temperature for a couple of days. If you want to work ahead I would recommend making the cookies and scooping them into balls. You can freeze the cookie balls or bake them off right away. You can make the ganache several days ahead and keep in the refrigerator. 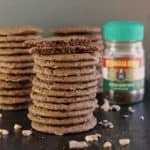 Assemble the cookies the day or day before you want to serve them. Let me know if you have any other questions.